23/05/14 -- Soycomplex: Beans closed lower on the day, but higher for the week, in what might best be described as light consolidation ahead of a 3-day weekend. US markets are shut Monday for the Memorial Day Holiday. The USDA announced 210,000 MT of US beans sold to unknown along with 120,000 MT sold to China for 2014/15 shipment. JC Intelligence estimated China’s May bean imports at 5.8-6.1 MMT, down versus 6.5 MMT in April. The Buenos Aires Grains Exchange said that rain continues to hold up the soybean harvest there, which at 69.9% complete is up only 3 points on a week ago. Harvesting this time last year was 93% complete. Argentine growers have gathered 41.6 MMT so far, and the BAGE forecast final production this year at a record 55.5 MMT. Some growers are now harvesting beans wet and paying the drying costs rather that risk pods shattering, they said. Favourable planting weather remains in the forecast for the Midwest this weekend, with just a few scattered showers. This means that Tuesday's holiday-delayed crop progress report should reveal plantings of around 55-60% complete versus 33% a week ago, the trade expects. Even northern Midwest farms are now warming up. The current beans:corn price differential will be catching the eye of those yet to plant, possibly pushing soybean acres up a little more than the 81.5 million forecast by the USDA earlier in the month. MDA Weather Services are said to have estimated the 2014 US bean yield at 45.9 bu/acre, which is 0.7 bu/acre more than the USDA's current forecast. Jul 14 Soybeans closed at $15.15 1/2, down 3 1/4 cents; Aug 14 Soybeans closed at $14.45 1/2, down 2 1/2 cents; Jul 14 Soybean Meal closed at $502.60, up $1.10; Jul 14 Soybean Oil closed at 40.38, down 48 points. For the week front month beans were up 50 1/2 cents, with meal gaining $22.40 and oil down 37 points. Corn: The corn market finished slightly higher on the day, but a little lower on the week. Trade was relatively quiet ahead of the long weekend, and the trading range was narrow. Various trade forecasts have US corn planting at 85-90% complete in next week's crop progress report from the USDA. Planting was 73% done as of last weekend and 86% complete this time a year ago. The Buenos Aires Grains Exchange reported very slow progress with the Argentine corn harvest, which is now only 33.1% complete versus 30% a week ago and 50.5% a year ago. They estimated production at 24 MMT,unchanged from a week ago. Turkey is tendering for 70,000 MT of optional origin feed corn. The Turkish Statistical Institute estimated Turkey’s 2014 grain crop at 33.7 MMT versus the 2013 crop of 37.5 MMT. Corn production was forecast at 5.5 MMT versus 5.9 MMT in 2013. MDA Weather Services were reported to have estimated 2014 US corn yield at a record 167.5 bu/acre, which is even higher than the USDA's current 165.3 bu/acre. Everything would have to go right between now and harvest time to achieve this sort of figure, but anything is possible. "The 5-day forecast is significantly drier in northern corn farms, southern Minnesota, Wisconsin and Michigan. This would spur corn planting where seeding has been retarded by persistent cold. A few showers are possible over the next few days, but not heavy rain, allowing corn and soybean planting to make good progress. Strong sunshine would increase soil temperatures. Northern corn farms have been persistently cold, so this is a very favourable forecast," said Martell Crop Projections. Good rains meanwhile further south could also help corn. "Strong showers would continued in the Southern Great Plains where a trough of low pressure spins out waves of thunderstorms. Another 2-4 inches of rain is predicted in Texas, Oklahoma and Kansas. Nebraska a key corn state is also expecting heavy rain along with southwest Iowa and western Missouri," they added. The French 2014 corn crop is now virtually all sown, and crop conditions show a marked improvement on a year ago. Jul 14 Corn closed at $4.78, up 1 1/4 cents; Sep 14 Corn closed at $4.75 1/2, up 1 1/2 cents. Jul 14 was 5 1/2 cents lower on the week. Wheat: The wheat market closed lower once more, with yet another rally attempt caving in. Chicago wheat has now finished lower for 12 of the last 13 sessions - the exception being a 1/4 cent gain in Monday! Heavy rains for US winter wheat on the southern Plains is seen as bearish, although most think that these have come too late to make a dramatic difference to yields. "Stormy weather has developed in the US heartland producing drenching rains in wheat farms. Waves of strong thunderstorms have brought heavy soaking rain to Texas, Oklahoma and Kansas. Drenching rains are arriving too late in the growing season for strong improvement in the wheat yield. The heading and grain-filling stages are already well advanced," said Martell Crop Projections. Meanwhile "spring wheat is in jeopardy in North Dakota from excessive wetness. Only one-quarter of the crop was planted May 18, 2-3 weeks behind schedule. This is the US second largest wheat state behind Kansas. Spring wheat planting has begun in the Canadian prairies, though progress is slow, due to persistent cold spring temperatures," they added. Saskatchewan spring crops planting is 22% complete versus 15% a week ago, 27% a year ago and 29% on average at this time. Spring wheat planting is 20% complete. The head of Russia’s grain union said that persistant hot and dry weather is a risk for Russia’s grain crop, although rain could quickly change that. The Russian Ag Minister's estimate for a grain crop of 100 MMT this year is not a scenario he would like to see happen as it would depress prices, he admitted. The Turkish Statistical Institute estimated Turkey’s 2014 wheat crop at 19.8 MMT versus the 2013 crop of 22.1 MMT. Drought has been their problem this winter. The Buenos Aires Grains Exchange estimated that Argentina's winter wheat crop was 2% planted versus 3.2% a year ago. 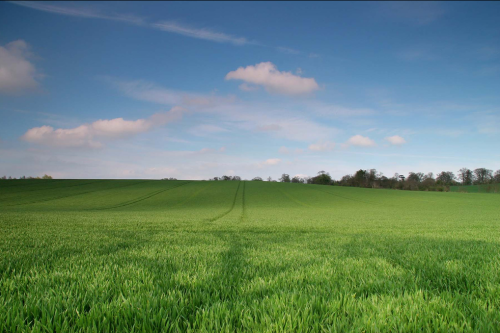 They see this year's wheat area at 4.3 million hectares, an increase of 18.8% on last year. The same rains that have disrupted Argentina's 2013/14 corn and soybean harvests, are also delaying fieldwork and wheat planting, although boosting soil moisture profiles, they added. The trade is expecting US 2014 spring wheat planting to be around 70-75% complete in Tuesday's crop progress report. Planting was 49% done versus the 5-year average of 68% last week. Jul 14 CBOT Wheat closed at $6.52 1/2, down 6 3/4 cents; Jul 14 KCBT Wheat closed at $7.45, down 6 3/4 cents; Jul 14 MGEX Wheat closed at $7.25 1/2, down 5 1/2 cents. For the week that puts CBOT wheat down 21 3/4 cents, with Kansas wheat 22 3/4 cents lower and Minneapolis down 13 3/4 cents. 23/05/14 -- EU grains markets finished mostly lower on the day, and lower for the week, heading into the 3-day weekend. For both London and Paris wheat this was the fifth weekly loss in a row. The day ended with May 14 London wheat going off the board unchanged at GBP150.50/tonne, with new front month Jul 14 down GBP0.25/tonne at GBP150.25/tonne and with new crop Nov 14 London wheat GBP0.75/tonne easier at GBP146.10/tonne. Nov 14 Paris wheat ended EUR2.00/tonne lower at EUR195.25/tonne, Jun 14 Paris corn slipped EUR0.25/tonne to EUR175.75/tonne, whilst Aug 14 Paris rapeseed fell EUR3.25/tonne to EUR358.50/tonne. For the week, May 14 London wheat dropped GBP1.20/tonne and Nov 14 slid GBP2.90/tonne, Nov 14 Paris wheat declined EUR4.00/tonne, Jun 14 Paris corn fell EUR1.75/tonne and Aug 14 Paris rapeseed was down half a euro. Rain on the US Plains, promising harvest prospects in Europe, upbeat production forecasts for Russia and Ukraine, and an easing of tensions between the latter two have all conspired against wheat in the past few weeks. London wheat has now fallen by around GBP20/tonne on old crop and GBP14/tonne on new crop from the late April highs, and we are now essentially back to where we were at the end of January before Russia decide to help itself to Crimea. Paris wheat still stands around EUR5/tonne off those lows, which perhaps owes a little to the recent strength in the pound. Brussels confirmed that it had issued more corn import licences than those for wheat export for the third week running last night. Corn import licences were granted for 343 TMT, taking the marketing year to date total to 13 MMT versus 10 MMT a year ago at this time. Wheat export licences were issued for 249 TMT, taking the 2013/14 total so far to a record 25.9 MMT, compared to only 17.6 MMT this time last season. Crop maturity across Europe continues to run ahead of schedule. FranceAgriMer said that 76% of the French winter wheat crop is heading, up from 44% a week ago and compared to only 17% this time last year. They did even bother reporting on the French winter barley crop, that was already 100% headed last week versus only 38% a year ago. They said that 98% of the French corn crop is now sown, compared to 85% this time last year, with 89% of the crop lifting versus 68% this week in 2013. They increased the proportion of the French winter wheat crop rated good/very good by 2 points from a week ago to 75%, versus 67% a year ago. French winter barley good/very good also rose 2 points to 72%, versus 66% in 2013. They said that 90% of the 2014 corn crop is in good/very good condition compared to 67% this time last year. The EU Commission this week estimated the 2014 French soft wheat crop up 1.6% on last year to 37.4 MMT, with barley output up 6.8% to 11.0 MMT and the corn crop 13.9% higher at 17.2 MMT. The Russian Ministry say that 66.1% of the 2014 spring wheat crop is now sown, along with 83.8% of the spring barley crop and 92.5% of the intended corn acreage. All those figures are ahead of a year ago. The head of Russia's Grain Union flagged up the current hot and dry conditions as being a possible threat to crop production this year. He did note though that the problem could be quickly rectified if rain comes. The latest weather forecasts show above average rains for most of the country's grain belt across the next 15 days. It's not until the 8-15 day time frame that temperatures start to moderate though, and even then eastern regions stay warmer to much warmer than normal. The Russian Ag Minister forecast the 2014 grain harvest there at 100 MMT, the highest since 2008. APK Inform said yesterday that they see Ukraine's 2014/15 grain exports holding up close to the record large estimates for this season, due to higher carry-in stocks and another strong production year. Tunisia bought 50,000 MT of optional origin soft wheat for June-July shipment. Malaysia and Pakistan are said to be shopping for Black Sea origin wheat. Indonesia is said to have bought 125,000 MT of Russian wheat this month. Russian wheat scored as being the cheapest in an Iraqi new crop tender earlier in the week. Another year of robust grain production, should we get it, and the aggressive marketing that traditionally accompanies it from the FSU, combined with an EU wheat crop at a six year high (and the second largest ever) and corn production here at 69.2 MMT (as forecast by the EU Commission on Wednesday, and the highest since at least the 1990's) is not a bullish scenario as far as price prospects are concerned. 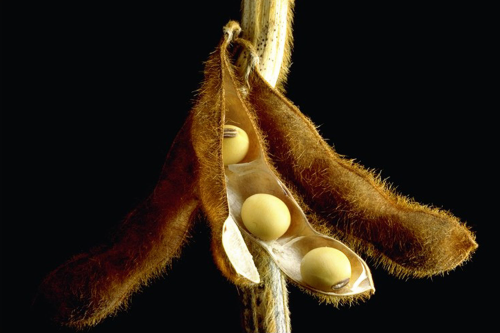 22/05/14 -- Soycomplex: Beans rose to fresh highs on a brighter outlook for the Chinese economy, and news from the USDA of 120,000 MT of new crop US beans sold to China. Note though that if China is to import the record 72 MMT of soybeans that the USDA is now forecasting for 2014/15 then they need to buy around 300 TMT every single working day of the year, allowing for holidays. So you could just say that this is routine business. You could also draw the conclusion that beans at $15/bushel are going to attract a lot of attention from growers from Ukraine to Uruguay, not just the obvious Big Three. For example, Indian farmers are likely to plant a record soybean area this year, according to a report on Reuters today. Meanwhile the summer harvest is winding down in South America. The Cordoba Grain Exchange in Argentina reported record soybean yields in the state this year, with 81% of the crop harvested they are expecting production to be in excess of 14 MMT. Weekly export sales of 164,400 MT of old crop US beans beat expectations, and maybe left a few wondering "where are all these beans coming from?" given that takes total commitments to almost 44.9 MMT versus a USDA forecast for the season of just over 43.5 MMT. Of that commitment total 42.6 MMT has already been shipped. The old crop situation on US beans is undeniably tight, but without a major weather scare in the summer, new crop holding onto current price levels close to $13 on new crop looks to me to be a tall order. The USDA also reported new crop soybean sales of 451,200 MT. Jul 14 Soybeans closed at $15.17 1/2, up 12 1/4 cents; Aug 14 Soybeans closed at $14.46 3/4, up 16 cents; Jul 14 Soybean Meal closed at $501.80, up $3.70; Jul 14 Soybean Oil closed at 40.78, up 31 points. Corn: The corn market closed a couple of cents firmer. Weekly export sales of 507,900 MT of old crop were in line with expectations, although new crop sales of only 62,500 MT were a bit disappointing. The US now has 93% of the USDA's projected export target on the books, which is about average for this point in the season. Unlike soybeans, unshipped corn sales represent a much larger proportion of total commitments, at 13.6 MMT for a season that ends in August. Also unlike soybeans, the corn market doesn't have the crutch of the oft quoted "insatiable" Chinese demand to lean on. The US shipped only 8,500 MT of corn to China in April, as the dispute over MIR 162 corn has essentially brought shipments of US corn to a halt. That isn't necessarily to whole story though, Chinese customs data showed that they only imported 93,062 MT of corn last month anyway, down 78% from a year ago. The Chinese government have now begun auctioning off corn from state reserves. Today's first sale of the year had an offering of 1.2 MMT, of which nearly 1 MMT got booked. Good planting weather with warm temperatures are in the forecast for the northern and eastern Midwest for the weekend. The Argentine Ag Ministry estimated their 2013/14 corn crop at 31.1 MMT versus a previous estimate of 29.8 MMT and far higher than the USDA's 24 MMT forecast. Their harvest is behind schedule. The Cordoba Grain Exchange estimated the state's corn crop at just under 10 MMT and said that harvesting is only 23% complete. The EU Commission estimated the EU-28 corn crop at 69.2 MMT versus 64.9 MMT in 2013. They see the French crop at 17.2 MMT versus 15.1 MMT last year, and forecast ending stocks rising to 14.9 MMT from 13.7 MMT this season. APK Inform said that Ukraine will export 19.5 MMT of corn next season, a figure pretty similar to the 2013/14 record (19.4 MMT shipped so far). Russian corn planting for the 2014 harvest is 91.6% done. Jul 14 Corn closed at $4.77, up 2 1/2 cents; Sep 14 Corn closed at $4.74, up 1 1/2 cents. Wheat: The wheat market extended it's recent declines, closing around 5-9 cents lower across the three exchanges. Weekly export sales were lukewarm at 142,200 MT of old crop and 209,800 MT of new crop. Heavy rain is on the way for the parched Southern Plains, but could come too late to make a big impact. "Wheat in Texas, Oklahoma and Kansas are expected to receive up to 4 inches of rain. Wheat development is too advanced for a significant improvement in the yield, as wheat heading is virtually completed. Grain filling would benefit from a soaking rain increase kernel weights and boosting the yield slightly," said Martell Crop Projections. The Russian Ag Minister increased his forecast for this year's grain crop there to 100 MMT versus 92.4 MMT in 2013, and the highest since 2008. Spring wheat planting in Russia is 61.2% complete, alongside 83.4% of the spring barley crop. Current conditions are hot and dry, but relief is in the forecast a week from now. Most of Ukraine is apparently in pretty good shape apart from a bit of dryness in the less productive east. China raised the price it will pay local farmers for wheat by 5.4% to the equivalent of around $380/tonne to encourage plantings. Their 2014 winter wheat crop is expected to total 117.6 MMT, a 1.5% rise on production last year. China also grows a relatively small amount of spring wheat, for which recent rains have been beneficial. Chinese wheat imports in 2014/15 are only expected to total 3 MMT versus 7 MMT this season. Their 2013 wheat crop suffered with quality issues caused by heavy rains at harvest time. A Reuters survey estimated the EU-28 soft wheat crop at a second highest ever 137.5 MMT. Agritel forecast production at 137.9 MMT and one analyst went as high as 141.5 MMT. Algeria bought 150,000 MT of feed barley of optional origin for July- August shipment. Jordan are tendering for 100,000 MT of hard milling wheat of optional origin for Oct–Nov shipment. Tunisia are tendering for 50,000 MT of optional origin milling wheat for June–July shipment. Jul 14 CBOT Wheat closed at $6.59 1/4, down 5 cents; Jul 14 KCBT Wheat closed at $7.52 1/2, down 9 cents; Jul 14 MGEX Wheat closed at $7.30 3/4, down 8 cents. 22/05/14 -- EU grains closed mostly lower, as yet another feeble attempt to rally proved to be relatively short-lived. Expiring tomorrow May 14 London wheat ended down GBP0.50/tonne at GBP150.50/tonne, and new crop Nov 14 London wheat closed GBP1.05/tonne lower at GBP146.85/tonne. Nov 14 Paris wheat closed EUR1.50/tonne easier at EUR197.25/tonne, Jun 14 Paris corn was up EUR0.50/tonne to EUR176.00/tonne (although other months were lower) and Aug 14 Paris rapeseed rose EUR3.50/tonne to EUR361.75/tonne. The European Commission forecast increased EU wheat and corn production this year, but with barley output understandably lower after last year's boost from heavy spring plantings. Exports of all three grains will decline in 2014/15, and ending stocks of all three will rise, they said. 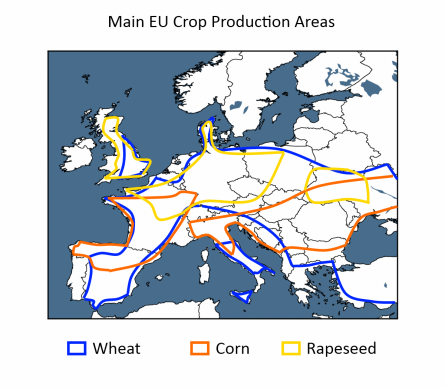 They estimated EU-28 soft wheat production in 2014 at 135.9 MMT, up 1.2% on last year. That includes 37.4 MMT from France (versus 36.8 MMT in 2013), 25 MMT from Germany (unchanged) and 14.7 MMT from the UK (up sharply from 11.9 MMT, with the potential to ultimately finish above 15 MMT). They see soft wheat exports in 2014/15 falling to 22 MMT from 27 MMT this season, meaning that ending stocks will rise to 11.9 MMT from 9.5 MMT. As far as barley output goes, they expect a 2014 EU-28 harvest of 55.7 MMT, down 6.4% on last year's 59.5 MMT. Exports will decrease to 7.0 MMT from 7.5 MMT, and ending stocks will rise to 8.2 MMT from 7.3 MMT, they said. For corn, they predict an EU-28 crop of 69.2 MMT, up 6.6% versus last year. Despite the higher production, exports will drop to 2.1 MMT from 2.8 MMT, and 2014/15 carryout will increase to 14.9 MMT from 13.7 MMT, they added. A Reuters survey estimated the EU-28 soft wheat crop even higher, at 137.5 MMT - a six year high and the second largest on record. The range of estimates was quite wide at 135.6-141.5 MMT versus 134.3 MMT last year.Some clearly think that yield potential this year is very good, if not exceptional. All wheat production was pegged at an average of 145 MMT, against 142.2 MMT in 2013. Agritel forecast an EU-28 soft wheat crop of 137.9 MMT. The Russian Ag Ministry raised their forecast for the grain crop there this year to 100 MMT, an 8.2% increase on a year ago. Current weather condition there are hot and dry, but this is expected to moderate to normal temperatures and above normal rainfall a week from now. They said that spring grain plantings are done on 8.1 million ha of wheat (61.2% of plan), 7.3 million ha of barley (83.4%) and 2.4 million ha of corn (91.6%). Ukraine is mostly warm and wet, providing near ideal "hothouse" growing conditions. APK Inform said that Ukraine's grain exports so far this season total 30.88 MMT, including 19.4 MMT of corn, 8.9 MMT of wheat and 2.3 MMT of corn. There's a further 314 TMT of grain loaded on vessels waiting to leave, they added. They forecast 2014/15 grain exports little changed, down 2% from this season's record. Carry-in of 11.5 MMT (up 19% versus a year ago) from last year's bumper grain harvest will help, they said. Ukraine will therefore export 30.5 MMT of grains in 2014/15, including 19.5 MMT of corn, 8.5 MMT of wheat and 2.3 MMT of barley, they predict. These are very similar totals to this season and this large volume of corn exports is likely to depress wheat usage in the EU for another year it would seem. The HGCA said that "If the weather during yield forming permits, the UK should be expected to return as a net wheat exporter after an absence of two seasons. As a result of this, GB prices are likely to need to become competitive with other European exporters." Currently they are not. Defra estimated UK wheat exports this season at only 450 TMT, an at least 23 year low, and down by almost 40% on even last year's poor showing. UK corn imports meanwhile will reach a record 2.18 MMT, almost 5 times the volume of wheat exports, they added. 21/05/14 -- Soycomplex: Beans finished sharply higher, with front end months showing the biggest gains. Fund money was estimated as being a net buyer of around 6-9,000 soybean contracts on the day. Better Chinese crush margins are said to have them back in the market, buying US and South American beans in the past few days. A Bloomberg survey said that Chinese crushers had bought over 600,000 MT of beans last week for September onwards shipment. Trade estimates for tomorrow's USDA weekly export sales report are zero for old crop and 500-700 TMT of new crop. Some of these reported Chinese sales may show up in that. Chinese customs data shows that they imported 6.5 MMT of soybeans in April, up almost 64% versus 12 months previously. US soybean exports to China last month were said to account for over 2.5 MMT of that total, with Brazil's at 3.95 MMT. China's Jan/Apr soybean imports were 21.95 MMT, up more than 41% on a year ago, with 16.3 MMT of that coming from the US and 5 MMT from Brazil. Japanese customs data shows that Japan imported 280,463 MT of beans in April, up 20.2% from a year ago, and with 242,156 MT of that coming from the US. Jul 14 Soybeans closed at $15.05 1/4, up 35 1/2 cents; Aug 14 Soybeans closed at $14.30 3/4, up 25 1/2 cents; Jul 14 Soybean Meal closed at $498.10, up $11.40; Jul 14 Soybean Oil closed at 40.47, up 40 points. Corn: The corn market ended with little change. The weekly ethanol grind came in at 925,000 barrels/day, up slightly on last week but below the level required to hit USDA targets. Chinese customs data showed that they only imported 93,062 MT of corn last month, down 78% from a year ago. Of that total only 8.5 TMT came from the US, with more than half April's corn imports coming from Ukraine. The MIR 162 problem is clearly having a major effect on Chinese demand for US corn. They were said to have imported 787 TMT of US corn in November, before the dispute over the MIR 162 variety broke. China's Jan/Apr corn imports total 1.27 MMT, down 12% on a year previously. Imports from the US during that period are down 40%. The Ukrainian Agrarian Confederation estimated their 2014 corn crop at 28.5-29.0 MMT, down only a relatively small amount from last year's record 30.9 MMT, given that output from Crimea no longer counts and for all the recent talk of reduced plantings and crop inputs. Russian corn plantings for the 2014 harvest are said to be 88% complete. Ukraine corn plantings are 90% done. IMEA said that Brazil's Mato Grosso state will reduce it's corn area for the 2014/15 harvest by 19% and production will fall 32% to 15.4 MMT. The European Commission estimated the EU-28 corn crop at 69.2 MMT versus 64.9 MMT a year ago. They see 2014/14 EU-28 corn ending stocks rising to 14.9 MMT from 13.7 MMT this season, as usage declines to 71.3 MMT from 73.7 MMT in 2013/14. Trade estimates for tomorrow's weekly export sales report are around 300-500 TMT of old crop and 100-200 TMT of new crop. Jul 14 Corn closed at $4.74 1/2, up 1 cent; Sep 14 Corn closed at $4.72 1/2, up 1/4 cent. Wheat: The market closed mostly lower once more, with another attempted rally fizzling out. The Ukrainian Agrarian Confederation estimated Ukraine’s 2014 wheat crop at 22.0-22.5 MMT, which is essentially unchanged from a year ago, despite the recent troubles. The market appears to have put the Ukraine issue to the back of it's mind, as the news out of the region has slipped from the front pages of every newspaper around the world. That doesn't necessarily mean that the issue has gone away. I hear that Ukraine needs to pre-pay Russia's GazProm for it's June gas requirement by Jun 2 or risk having the gas turned off. The amount being quoted as due is $1.658 billion. China only sold 5% of the 811 TMT of wheat it put up for auction today. Recent sales have been very poorly received, and this one was no different. Chinese customs data shows that they imported 373,606 MT of wheat in April, up 84% versus a year ago. Jan/April imports are 2.2 MMT, a 148% increase versus the same period in 2013. Rusagrotrans estimated Russia’s 2014 grain crop at 95-97 MMT, up from 92.4 MMT in 2013, and better than SovEcon's forecast of 90 MMT from yesterday. They see Russia’s 2014/15 grain exports increasing 27-28 MMT from 25.3 MMT in 2013/14. That's probably bad news for wheat prices, especially in the first half of the season when they are normally their most aggressive. Russian wheat was the cheapest offer in an Iraq tender for 150 TMT of wheat for Sep/Oct shipment today. The European Commission forecast the 2014/15 EU-28 soft wheat crop at 135.9 MMT versus 134.3 MMT a year ago. They see exports at 22.0 MMT versus 27.0 MMT this season, and ending stocks at 11.9 MMT versus 9.5 MMT in 2013/14. Weekly export sales for tomorrow are seen at 50-150 TMT of old crop and 150-300 TMT of new crop. Jul 14 CBOT Wheat closed at $6.64 1/4, down 6 1/4 cents; Jul 14 KCBT Wheat closed at $7.61 1/2, down 6 3/4 cents; Jul 14 MGEX Wheat closed at $7.38 3/4, up 1/2 cent. 21/05/14 -- EU grains were mixed, but mostly a little lower, as yesterday's consolidation proved to be short-lived. The day ended with May 14 London wheat closing down GBP0.05/tonne at GBP151.00/tonne, and new crop Nov 14 London wheat GBP1.15/tonne lower at GBP147.90/tonne. Nov 14 Paris wheat closed EUR1.00/tonne lower at EUR198.75/tonne, Jun 14 Paris corn was down EUR1.50/tonne at EUR175.50/tonne and Aug 14 Paris rapeseed ended the day unchanged at EUR358.25/tonne. Fresh news was relatively lacking, and lower still seems to be the path of least resistance. The Ukraine Farmers Club forecast grain production there this year at 60.0-61.5 MMT, that's down on last year's record 62.9 MMT output, but not a bad result at all considering that SovEcon yesterday increased their Russian grain production estimate by 2 MMT, thanks to the extra volume from the annexation of Crimea. They estimated the Ukraine corn crop at 28.5-29.0 MMT versus 30.9 MMT last year, with wheat output little changed at 22.0-22.5 MMT and a barley crop of 8 MMT versus 7.6 MMT in 2013. The Ukraine Ministry said that spring grain planting there is 90% complete at 7.52 million hectares, including 4.64 million ha of corn. They've also sown 4.23 million ha of sunflowers and 1.54 million ha of soybeans. Russian spring grain plantings meanwhile are 68.3% done on 21.8 million hectares, which is 4.6 million ha more than at this time a year ago. 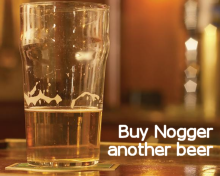 That includes 7.4 million ha of wheat, 7.1 million ha of barley and 2.3 million ha of corn. The pound rose to 1.69 against the US dollar, threatening to break through the 1.70 mark for the first time since October 2008. It also hit 1.2350 versus the euro, it's best since the first few days of 2013. Neither is good news for UK export prospects, demand for which is virtually non-existent in 2014/15. Yesterday's news that UK inflation had risen to 1.8% in April, from 1.6% in March, the first increase in 10 months, adds weight to market expectations for a domestic interest rate hike before too long. Spain said that it had imported only 172.8 TMT of wheat in March, down 18% from February and 21% below the volume imported in March 2013. In contrast it imported 627.2 TMT of corn in March, nearly double the amount shipped in a year previously, echoing an EU-wide trend. Iraq bought 150 TMT of Russian wheat for Sep/Oct shipment. They seem to be the most aggressive seller of new crop wheat around at the moment. Rusagrotrans estimated Russia’s 2014 grain crop at 95-97 MMT versus 92.4 MMT in 2013. They estimated Russia’s 2014 grain exports at 27-28 MMT versus 25.3 MMT in 2013. Big crops and the correspondingly aggressive export stance from the FSU nations is rarely good news for EU grain prices. Egypt said that it had so far bought 2.75 MMT of new crop wheat on the domestic market, and that it expects to buy a total of 4.4 MMT this season. 20/05/14 -- Soycomplex: Beans closed lower in Turnaround Tuesday style, with funds estimated as being a net seller of around 3-5,000 contracts on the day. Rumour has it that China is still having problems opening up Letters of Credit to pay for South American soybean cargoes. The Chinese government sold more than 80% of the 300 TMT of soybeans offered up for auction today. Oil World estimated the global 2013/14 oilseeds crop at 487.5 MMT versus a previous forecast of 483.5 MMT and 457.8 MMT last season. They pegged the world soybean crop at 280.0 MMT versus 280.6 MMT previously and 267.4 MMT in 2012/13. They see world soybean ending stocks in 2013/14 at 73.1 MMT versus 78.2 MMT previously and 63.1 MMT in 2012/13. They didn't give a figure for the coming season, but other analysts see 2014/15 soybean carryout rising further to around 80-82 MMT. The predicted El Nino weather event for summer 2014 would normally be beneficial to US soybean production. Dr Cordonnier estimated 2014 US soybean yields at 44.5 bu/acre, fine tuning it from a previous estimate of 44.0-45.0 bu/acre. He estimates production at a record 3.62 billion bushels, which is around 98.5 MMT, some 9 MMT higher than in 2013. He left both his Brazilian and Argentine 2013/14 production estimates unchanged at 86.5 MMT and 55 MMT respectively. Brazil's IMEA estimated the Mato Grosso 2014/15 soybean planted area at 8.67 million hectares versus 8.35 million in 2013/14. They see output in Brazil's largest producing state at 27.31 MMT versus a 2013/14 estimate of 26.04 MMT. The USDA announced 110,000 MT of optional origin beans sold to China for 2014/15 shipment. The combination of improved US yields, on the back of record plantings, followed by an increase in sowings in Brazil for 2014/15 equals a lot of bearish factors stacked against higher soybean prices in the months ahead. We will however undoubtedly get the usual weather market at some point across the summer. Jul 14 Soybeans closed at $14.69 3/4, down 15 1/2 cents; Aug 14 Soybeans closed at $14.05 1/4, down 14 1/2 cents; Jul 14 Soybean Meal closed at $486.70, down $3.80; Jul 14 Soybean Oil closed at 40.07, down 35 points. Corn: The corn market finished around 3-4 cents lower. Fund money was judged as being a net seller of around 4,000 corn contracts on the day. Last night's USDA planting progress report revealed that growers have now pretty much caught up with the average pace for this time of year, and in some key states like Illinois and Indiana are actually ahead of normal. Dr Cordonnier estimated the US corn yield at 162.0 bu/acre, down from a previous estimate of 163-165 bu/acre, although up on 158.8 bu/acre last year. He pegs the 2014 US corn crop at 13.66 billion bushels. He left his 2013/14 Brazilian corn crop estimate unchanged at 73.5 MMT, along with Argentina's at 24.0 MMT. 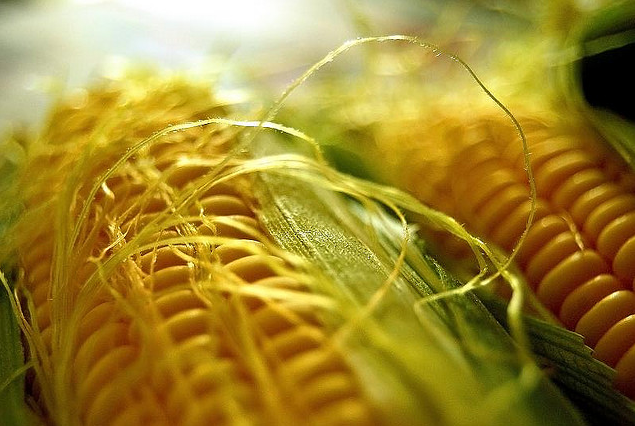 South Korea's MFG bought 198,000 tons of optional origin corn for Nov-Dec shipment. Russian corn planting is said to be around 86% complete, with Ukraine at around 90% done. There are some suggesting that Ukraine may not plant much more than what is already in the ground due to credit problems. There's also some talk of heat and dryness being an issue in large parts of Russia. The very heavy rains of last autumn that cut winter plantings back in Russia however means that sub soil moisture levels are still good, although surface moisture levels are getting a bit thin in places, I am told. For now it doesn't seem to be a problem, although it's a situation that certainly merits monitoring given what drought in the region has done to the grain markets in some recent years. Corn planting in France and Germany is well advanced compared to 12 months ago. On the weather front in the US "strong warming is predicted in the week ahead with abundant sunshine, improving planting conditions. Last week was cold in the Midwest with temperatures 5-6 F below average. Less rain is also predicted, encouraging drying. Strong warming and drying in the Midwest is evidence of a fundamental shift in the weather pattern. A warm ridge of high pressure would replace a cold trough previously," said Martell Crop Projections. Jul 14 Corn closed at $4.73 1/2, down 3 3/4 cents; Sep 14 Corn closed at $4.72 1/4, down 3 1/4 cents. Wheat: The wheat market closed lower, ultimately failing in an attempt to rally, having traded higher for much of the morning. Fund money was estimated as being a net seller of around 2,000 Chicago wheat contracts on the day. US weather conditions on the Plains are seen turning wetter, although this moisture may come too late to be of much benefit to winter wheat. "Drought stressed wheat in Oklahoma and Texas are expecting a drenching rain, at least 1.5 inch but up to 3-4 inches. Kansas is expecting .50-1.25 inches. This would be the wettest week since September 2013 in Southern Plains wheat. Wheat would not benefit much from late spring rainfall as wheat development is well advanced. Kansas wheat is 70% heading, while Oklahoma and Texas heading has reached 90-95%. Heavy rainfall may increase kernel weights, stabilising the yield though strong improvement is not expected. 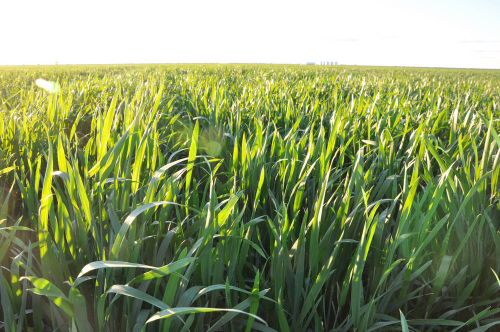 Hard red wheat conditions worsened to a season low on May 18, 22% good-excellent, 27% fair and 51% poor-very poor," said Martell Crop Projections. SovEcon estimated Russia’s 2014 grain crop at 90.0 MMT versus a previous estimate of 88.0 MMT due to additional supplies from Crimea. Production in 2013 (excluding Crimea) was 92.4 MMT. They see wheat output this year at 50.0 MMT versus 52.1 MMT in 2013/14. Russia’s 2014/15 wheat exports were estimated at 17.5 MMT versus a 2013/14 estimate of 18.3 MMT. Japan is feeding less wheat as corn prices have regained their more normal discount. Japan’s Ag Ministry said that the use of wheat in animal feed in March was 2.5% versus 2.7% a month previously and 3.6% in March 2013. Corn usage in feed meanwhile has increased to 46.2% versus 46% in February and 42.2% in March 2013. Japan are staging their regular weekly tender, this time looking for 97,372 MT of food wheat for June–July shipment of a mixture of US, Australian and Canadian origin. Jul 14 CBOT Wheat closed at $6.70 1/2, down 4 cents; Jul 14 KCBT Wheat closed at $7.68 1/4, down 1/2 cent; Jul 14 MGEX Wheat closed at $7.38 1/4, down 1/2 cent. 20/05/14 -- EU grains markets finished the day higher, in consolidation from the recent sharp correction. This was the first time London wheat had managed a higher close in 11 sessions, during which time it has fallen GBP16.75/tonne. The day ended with May 14 London wheat closing GBP0.80/tonne firmer at GBP151.05/tonne, with new crop Nov 14 London wheat GBP1.15/tonne higher at GBP149.05/tonne and Nov 14 Paris wheat EUR2.50/tonne steadier at EUR199.75/tonne. Jun 14 Paris corn was up a euro at EUR177.00/tonne, whilst Aug 14 Paris rapeseed rose EUR0.75/tonne to EUR358.25/tonne. The wheat market is desperate for something bullish to hang onto, maybe the Australian Bureau of Meteorology's announcement that an El Nino event this summer is 70% likely is enough. Barclays said that wheat has advanced by an average of 13% during 6 previous El Nino years going back to 1986. Certainly El Nino would normally wreak havoc on Australia's wheat crop. It would also however typically bring a relatively cool and wet summer to the US Midwest, as well as provide plenty of rain in South America. The latter could be beneficial to the wheat crop in Argentina and Brazil, depending on the exact timing of it's arrival. 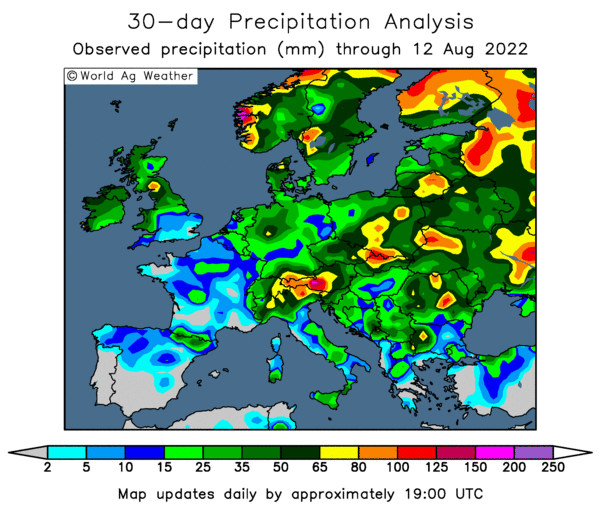 Meanwhile crops in Europe look great, the recent warm and dry spell is set to give way to soaking rains by the end of the week, which should be ideal. The German Stats Office said that winter grains there had been sown on 5.42 million hectares, including 3.154 million ha of wheat (versus 3.06 million the previous year) and 1.24 million ha of barley (versus 1.21 million). Spring grains, excluding corn, had been planted on 558k ha, versus 551k a year ago. German growers will also plant 510k ha of corn, up from 497k in 2013, they added. 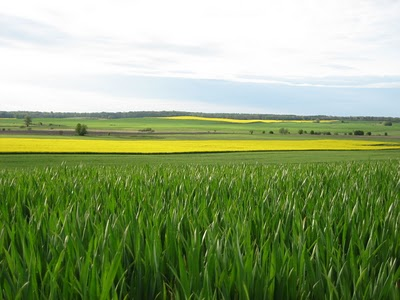 Oil World estimated the EU-28 rapeseed crop at a record 21.9 MMT, up from 21.3 MMT in 2013. They forecast the EU-28 2014/15 crush at 23.5 MMT, versus 23.1 MMT this season. EU-28 rapeseed imports will fall from 3.6 MMT in 2013/14 to 2.9 MMT next season due to the higher domestic production levels, they said. Russian spring wheat has been planted on 6.7 million hectares, 2.2 million more than this time last year, and 50.7% of the intended area, the Ag Ministry said. Russian growers have also planted 7.0 million ha of spring barley (79.8% of plan), along with 2.2 million ha of corn (85.8%), they added. The word out of Russia is that crop conditions are currently similar to last year. SovEcon estimated Russia’s 2014 grain crop at 90.0 MMT versus a previous estimate of 88.0 MMT and the 2013 crop of 92.4 MMT. They pegged Russia’s 2014/15 grain exports at 24.0 MMT versus a previous estimate of 22.0 MMT although still down slightlyfrom their 2013/14 estimate of 25.6 MMT. Wheat exports will account for 17.5 MMT of that versus a 2013/14 estimate of 18.3 MMT, they said. Lebanon bought 30,000 MT of Romania wheat for June shipment. Jordan bought 50,000 MT of optional origin barley for October shipment and is tendering for 150,000 MT of optional origin milling wheat for Sept-Nov shipment. Algeria is looking for 50,000 MT of optional origin barley for Jul-Aug shipment. Russian wheat was said to be the cheapest offer in an Iraqi tender for hard wheat for August shipment. 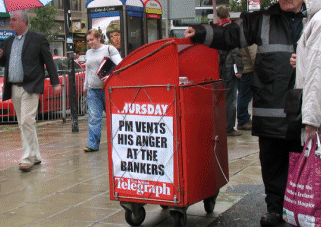 20/05/14 -- Ian Tremain is back! Five years after leaving Tremains Ltd, Ian Tremain has re-entered the animal feed supply business and launched Anode Feeds Ltd.
“An anode emits a positive charge and I felt the name reflected what I’d like a new company to feel like”, said Ian. Anode Feeds will operate out of a former poultry mill in Cannington, near Bridgwater and will be exclusively supplying the trade with feed ingredients, meal and blends. “We have the ability to make small runs and bespoke diets and while we can supply bulk feeds, our point of difference will be our ability to provide tote and small bags competitively”. Further information can be found by contacting Ian on 07811 198979.
Who says that there's no such thing as a free lunch? Ian's just had one. I'm sure his finger will be simply itching to hit the donate button, seeing as my lunchtime is also looming. Very thirsty work this blogging malarkey you know. Meanwhile, sugar beet. Does anybody want any? I've got a bit of SupaFlow to shift this month. POA. For you I make speshial price beautiful lady/handsome genitalman etc, etc. 19/05/14 -- Soycomplex: Beans closed with decent gains. Weekly export inspections came in at 167,953 MT, which was towards the top end of the expected 80-175,000 MT. Inspections for the 2013/14 season to date are now almost 41.9 MMT versus 34.3 MMT this time a year ago. The Argentine harvest is making only slow progress (around 69% done, say the Ag Ministry) compared with a year ago, dogged by rain. Those rains however appear to have boosted yields. These are being called "exceptional" in Western Chaco state in the north of the country, averaging 4.0-4.2 MT/ha compared to the 10-year average of only 1.64 MT/ha. China are to auction 300,000 MT of soybeans from state-owned reserves on tomorrow. Last week's auction was better received that expected. Chinese crush margins are said to be "nominally in the black" now. They are said to have been fairly active buyers of new crop US beans in the past week or so. 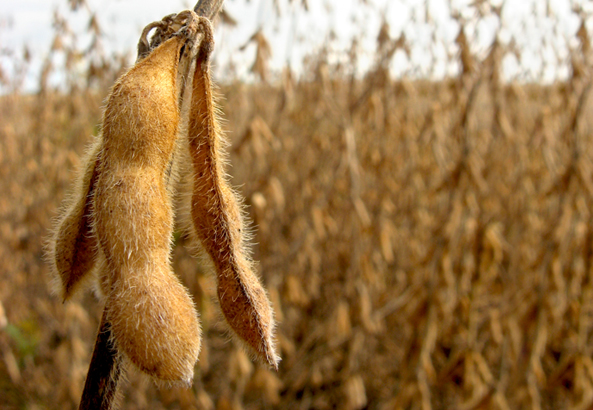 Funds were estimated to have been net buyers of around 10,000 soybean contracts on the day. The USDA were expected to report US 2014 soybean plantings at around 30-35% complete. They came out with 33% done versus the 5-year average of 38% and up 13 points from a week ago. Minnesota is a notable laggard at 16% done versus 45% normally. Soybean emergence was 9% versus 11% normally. AgCanada estimated Canada’s 2014 canola area at 8.013 million hectares versus a previous estimate of 8.75 million. Jul 14 Soybeans closed at $14.85 1/4, up 20 1/4 cents; Aug 14 Soybeans closed at $14.19 3/4, up 20 cents; Jul 14 Soybean Meal closed at $490.50, up $10.30; Jul 14 Soybean Oil closed at 40.42, down 33 points. Corn: The corn market closed around 5 to 6 cents lower on the day. Weekly export inspections of just over 1 MMT were in line with the expected 950,000 MT to 1.2 MMT. The season to date total is now 31.5 MMT versus 13.1 MMT a year ago. The FAO estimated Argentina’s 2013/14 corn crop at 25.0 MMT versus the USDA's forecast of 24 MMT. The Ukraine 2014 corn crop is 89% planted, and Russia's is 79% done as of Friday. Ukraine said that it had exported 19.1 MMT of corn so far this year, with Russia's export total at 3.7 MMT - both are records. The USDA were expected to report US 2014 corn plantings at around 70-75% done as of Sunday night. The figure that they came up with was 73%, slightly behind the 5-year average pace of 76%, but not drastically so. Michigan (29% done versus 65% normally), Minnesota (53% versus 81%), North Dakota (17% versus 54%) and Wisconsin (36% versus 61%) are the stand-out laggards. Illinois (84% versus 73%), Indiana (72% versus 62%), Missouri (92% versus 77%) are ahead of normal. The USDA said that 34% of the crop is emerged versus the 5-year average of 42%. A year ago 71% of the US corn crop was planted and only 19% was emerged, so beating last season's average yield of 158.8 bu/acre is still possible, although whether they can hit the USDA's current trendline yield estimate of 165.3 bu/acre is another matter. Good planting weather is forecast for most of the US corn belt this week. Jul 14 Corn closed at $4.77 1/4, down 6 1/4 cents; Sep 14 Corn closed at $4.75 1/2, down 5 3/4 cents. This was the lowest close for a front month since Mar 14. Wheat: The wheat market ended the day little changed, recovering from trading in the red for much of the day. Weekly export inspections of 552,525 MT were in line with the expected 450-575,000 MT. That takes the total inspected for export for the season to just short of 30.2 MMT versus 26.3 MMT this time a year ago. The USDA say that exports for the current season, which finishes in two weeks, will total 31.5 MMT. That now looks unlikely. AgCanada estimated Canada’s 2014 wheat area at 10.9 million hectares versus a previous estimate of 9.99 million and the USDA's current forecast of only 9.8 million acres. They now see production in 2014/15 at 29.6 MMT. That's down from the record 37.5 MMT produced a year ago, but higher than other estimates from a bit earlier in the year and the USDA's current 28.5 MMT. Turkey are tendering for 190,000 MT of optional origin milling wheat for Jul–Aug shipment, along with 100,000 MT of optional origin barley for Jun-Jul shipment. The FAO estimated Argentina’s 2014/15 wheat crop at 10.5 MMT, up 14% from a year previously. Russia said that it had exported 17.3 MMT of wheat so far this season, including 469 TMT in the first two weeks of May. The USDA reported that 57% of the US winter wheat crop is now headed, in line with the 5-year average of 58%. They said that 29% of the crop was rated good/excellent, down one point on last week and 2 points less than a year ago. Spring wheat is 49% planted versus the 5-year average of 68%. Jul 14 CBOT Wheat closed at $6.74 1/2, up 1/4 cent; Jul 14 KCBT Wheat closed at $7.68 3/4, up 1 cent; Jul 14 MGEX Wheat closed at $7.40 1/4, up 1 cent. 19/05/14 -- EU grains closed lower, with London wheat extending its decline to ten sessions in a row. Fresh news was scarce, but the path of least resistance remains lower. May 14 London wheat ended down GBP1.45/tonne at GBP150.25/tonne, and new crop Nov 14 London wheat closed GBP1.10/tonne lower at GBP147.900/tonne. Nov 14 Paris wheat closed EUR2.00/tonne easier at EUR197.25/tonne, Jun 14 Paris corn fell EUR1.50/tonne to EUR176.00/tonne and Aug 14 Paris rapeseed was down EUR2.50/tonne to EUR357.50/tonne. Concerns about Ukraine have gone on the back burner, the market is now looking at a very good European crop that is both well advanced of normal in maturity and in significantly better condition than a year ago. Export levels out of the FSU are also well ahead of where they were at this point in 2013. Ukraine said that it had exported 30.5 MMT or grains so far this season, up 43.2% on a year ago. That total includes 19.1 MMT of corn, 8.8 MMT of wheat and 2.3 MMT of barley. Russia said that it had exported 23.7 MMT of grains to May 14, a 60.3% increase on a year ago. That includes 17.3 MMT of wheat, 3.7 MMT of corn and 2.4 MMT of barley. Russia’s Ag Ministry said that Russia’s 2013 grain crop was 89.3 MMT versus 68.7 MMT in 2012. Despite the large level of exports, the Ukraine Ministry said that grain stocks there as of May 1 were still up 12% on a year ago at 9.1 MMT, including 3.4 MMT of wheat, 4.3 MMT of corn and 900 TMT of barley. Egypt said that it had bought 2.5 MMT of new crop wheat on the local market, out of a total domestic purchase target of 4 MMT. They said that this year's harvest will amount to 9 MMT versus 8.5 MMT a year ago. Turkey is shopping for 190,000 MT of optional origin milling wheat for Jul/Aug shipment, along with 100,000 MT of optional origin barley for Jun/Jul shipment. UK crop conditions look stupendous. A very good dose of weekend sunshine, followed by the forecast bout of heavy mid-week rains, will further add to crop health. Crop conditions in France are also ahead of year ago levels, according to FranceAgriMer on Friday. Things have also perked up considerably in Germany after some early season concerns. 16/05/14 -- Soycomplex: Beans finished mixed, lower on old crop and higher on new crop. Fresh news was limited to end the week. The USDA reported private soybean sales of 180 TMT to "unknown" for 2014/15 shipment. They also reported the sale of 40 TMT of soyoil to China for 2013/14 shipment. Rumours of a vessel set to load beans in Brazil bound for China being unable to obtain a Letter of Credit dampened sentiment. The South American harvest is entering the final straight, just about done in Brazil and past two thirds of the way through in Argentina. Both are expected to have brought in record soybean crops, and both might fancy a tilt at breaking that record again in 2014/15. US growers certainly also will, with the USDA reporting plantings there at 20% complete as of last Sunday, which now is in line with the 5-year average of 21% despite all the talk of weather-related delays. That may have advanced to something like 30-35% this week, we will know on Monday night. As of this Sunday last year plantings were only 24% done. US soybean ending stocks to usage at the end of 2013/14 is currently seen at a record tight 3.8%, expanding to a more comfortable 9.6% by the end of 2014/15. World ending stocks in 2014/15 meanwhile are expected to be almost 12 MMT above the previous record high at 82.23 MMT. China will auction another 300 TMT of soybean reserves on Tuesday next week. Ukraine is 95% planted on it's intended sunflower acreage and 90% done with it's anticipated record 2014 soybean crop. South Korea bought 55 TMT of South American soymeal for Sep 1-20 shipment in a tender. The latest Commitment of Traders report shows managed money increasing its long in beans by a net 6,281 contracts for the week through to Tuesday night. Jul 14 Soybeans closed at $14.65, down 5 1/4 cents; Aug 14 Soybeans closed at $13.99 3/4, down 2 cents; Jul 14 Soybean Meal closed at $480.20, down $1.20; Jul 14 Soybean Oil closed at 40.75, down 29 points. For the week that puts front month beans down 36 cents, with meal losing $17.30 and oil falling 23 points. Corn: The corn market ended with little change on the day, but lower for the week. The trade expects that US farmers will have made good progress with corn plantings again this week, with the USDA likely to maybe report that 70-75% of the crop is in the ground as of Sunday night. A year ago US farmers equalled their busiest corn planting week on record, sowing 43% of the crop in a week, to take plantings to 71% complete. "I wouldn’t be surprised if corn planting is north of 75% complete on Monday afternoon’s report," said Benson Quinn's Brian Henry. "China is formalizing plans to auction the first 1 MMT of what’s reported to be 70 MMT of reserve corn stocks. They could feasibly offer a total of 20 MMT over the course of the next 6 months," he added. That is a phenomenally large volume of corn. No wonder they are in no hurry at all to approve the MIR 162 variety, which has effectively halted imports from the US entirely. Chinese think tank CNGOIC yesterday estimated China's 2014/15 corn production at a record 222.1 MMT, outstripping consumption by almost 26 MMT. Ukraine reported corn planting at 89% complete. Russia is 79% done, and France 92% finished. Weakness in wheat weighed on corn for a third day today. Tonight's Commitment of Traders report shows fund money shedding 11,435 contracts of their length for the week through to Tuesday night. That still left them net long of a meaty 255k lots, which in theory could see the market have some more downside if they continue to ditch that length. They've certainly been net sellers since Tuesday night, dumping an estimated 5,000 lots on Wednesday and a further 10,000 contracts on Friday. They were judged to have been net sellers of maybe 1,000 in the corn pit today. The USDA currently see 2014/15 US corn ending stocks to usage rising to 12.9%, although that is dependent on a record high 2014 average yield of 165.3 bu/acre, which may be over optimistic. World ending stocks to usage in 2014/15 is seen at 18.8%, although again this relies for a large part on these record US yields being achieved. Jul 14 Corn closed at $4.83 1/2, down 3/4 cent; Sep 14 Corn closed at $4.81 1/4, up 1/4 cent. Corn lost 22 cents on the front month this week. Wheat: The market closed lower across the three exchanges, with Chicago wheat again managing to put up the best show of resistance. Egypt bought just the one cargo of Ukraine origin wheat in it's tender for late June shipment. Russia said that it had planted 53.5% of it's intended spring grains acreage, including 34.4% of it's wheat and 73.8% of it's barley. Ukraine's spring grain area is 89% planted, according to the local Ministry. Winter wheat planting is now underway in Argentina, with the Buenos Aires Grain Exchange forecasting an 18.8% hike in area to 4.3 million hectares. Good moisture profiles, good prices (relative to corn) and crop rotation purposes all offer growers an incentive to plant more this year, they said. SovEcon increased their forecast for Russia's 2013/14 wheat exports from 17.8 MMT to 18.4 MMT. There's some suggestion that the high level of Russian exports this season will mean that carryover at the end of the season is only minimal. That may explain why there were no Russian offers in the Egyptian tender. The Indian Ag Ministry estimated their 2014/15 wheat crop at a record 95.85 MMT, up from 93.61 MMT a year ago. US spring wheat plantings continue to lag, however strong Midwest warming is predicted next week, according to Martell Crop Projections. "Temperatures are predicted be above-average in the mid 70s-mid 80s F. Night temperatures would rise into the 60s F, a big improvement," they said. However, with the rise in mercury also comes "a renewed risk of showers and thunderstorms, although the 6-10 day forecast is favourable for advancing spring planting suggesting near average Midwest rainfall and temperatures," they added. Tonight's Commitment of Traders report shows fund money about square in Chicago wheat for the week through to Tuesday night. Their net long stands at 45,307 contracts. They were however net sellers of 2,353 Kansas wheat contracts, and are estimated to have been further significant sellers since. Jul 14 CBOT Wheat closed at $6.74 1/4, down 4 cents; Jul 14 KCBT Wheat closed at $7.67 3/4, down 11 cents; Jul 14 MGEX Wheat closed at $7.39 1/4, down 15 3/4 cents. Chicago wheat lost 39 3/4 cents on the week, with Kansas wheat down by 51 1/4 cents and Minneapolis losing 55 1/2 cents. 16/05/14 -- EU grains were mixed to end the week, with old crop London wheat extending its unbroken run of falling every day since Bank Holiday Monday on May 5th. Paris wheat had also fallen in every session since then, but managed to post a small gain at the close today, although now that the May 14 contract has expired, it's new crop Nov 14 that is the front month there. The day ended with May 14 London wheat closing down GBP1.05/tonne at GBP151.70/tonne, and new crop Nov 14 London wheat GBP0.25/tonne lower at GBP149.00/tonne. Nov 14 Paris wheat closed EUR0.25/tonne higher at EUR199.25/tonne, Jun 14 Paris corn was down EUR0.50/tonne at EUR177.50/tonne and Aug 14 Paris rapeseed ended the day EUR0.75/tonne higher at EUR360.00/tonne. For the week May 14 London wheat slumped GBP9.75/tonne, whilst Nov 14 was down a slightly more modest GBP7.15/tonne. Nov 14 Paris wheat fell EUR8.00/tonne, Jun 14 Paris corn was down EUR6.75/tonne and Aug 14 Paris rapeseed was EUR1.00/tonne higher. Old crop London wheat has now virtually given up all the gains put on in February and March that followed Russia's annexation of Crimea. It has also surrendered the large premium that it held over new crop. Just a month ago today May 14 traded at a premium of more than GBP10/tonne to the Nov 14 contract and (even just 2 weeks ago the difference was almost GBP9/tonne) and tonight that differential is only GBP2.70/tonne. 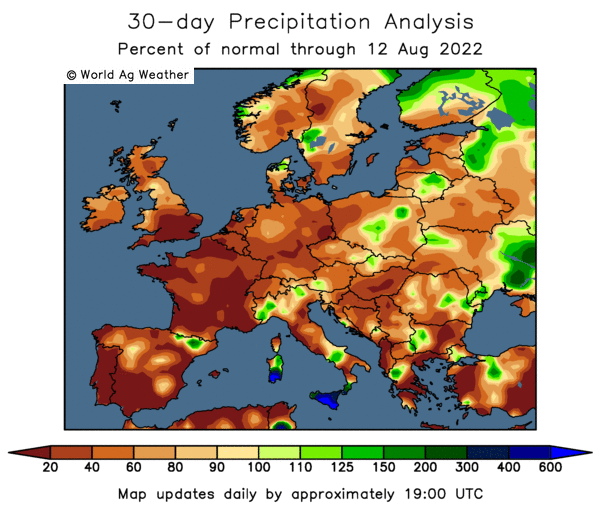 European crop conditions largely look very good, with the warm dry spell forecast for the weekend and early next week likely to be of benefit. 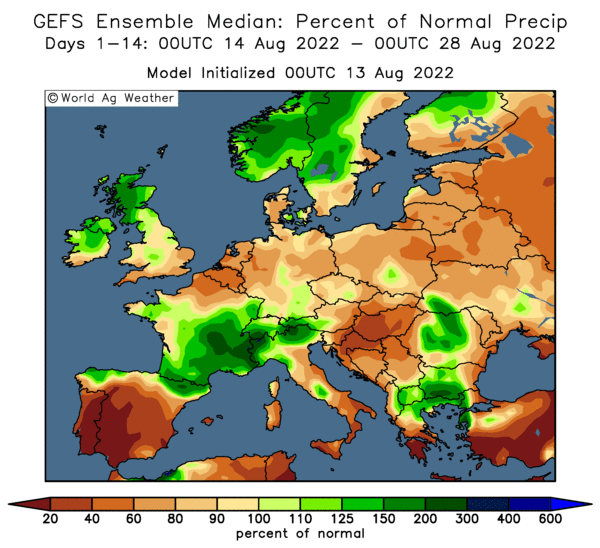 Rain returns by the middle of next week, and the 15-day forecast predicts above average precipitation for just about the entire continent, including some of the drier areas of Spain and France. FranceAgriMer reported that 44% of the French winter wheat crop is now heading, up from 18% a week ago and well ahead of only 6% this time last year. The entire French winter barley crop meanwhile is headed, compared to only 38% of it a year ago, and even 4% of the spring barley crop is heading against 1% this time in 2013. They said that 89% of the spring barley crop is displaying an ear of at least 1cm versus only 39% a year ago. French corn planting meanwhile is 92% complete compared to 77% this time last year, and 79% of the crop is "lifting" compared to 46% in 2013. FranceAgriMer said that 73% of the winter wheat crop is in good/very good condition, unchanged on a week ago and 6 points better than a year ago. Winter barley rated good/very good was also unchanged at 70%, 3 points ahead of this time last year. Spring barley is 70% good/very good, up a point on last week, although less than 79% a year ago. The French corn crop is rated 91% good/very good versus only 72% at this date in 2013. Brussels issued more corn import licences (448 TMT) than it did wheat export ones (424 TMT) for the second week running. Wheat exports authorised to date total 25.7 MMT against 17.4 MMT this time a year ago. Corn imports are at 12.7 MMT versus 9.85 MMT in 2012/13. Egypt's GASC bought just one cargo of Ukraine origin wheat in it's tender. The price paid was said to be $289 plus $13.49 freight. French wheat was reportedly offered at $290.87, and US wheat $282.87 - although much higher freight ruled out the latter. There weren't many offers in this tender, which may be down to the fact that the Jun 20-30 shipment period falls awkwardly between old and new crop. It may also show trader reluctance to offer to Egypt specifically after some reported problems with Letters of Credit recently. The Ukraine Ministry said that spring grain plantings there were complete on 7.418 million hectares, or 89% of plan. That's less than 7.978 million ha this time last year. The planted total includes 4.582 million ha of corn (also 89% of plan). Will all the intended area get sown? Currently most analysts seem to think so, although inputs of fertiliser and pesticides will probably be reduced due to credit issues. The same financial problems may however also make Ukraine growers even more "needy" sellers at harvest time than normal. Russia has planted 17.1 million hectares of spring grains (53.5% of plan), which is 2.6 million more than a year ago. That includes 4.5 million ha of wheat (34.4%), 6.4 million ha of barley (73.8%) and 2 million ha of corn (79.2%). Whilst Ukraine has picked up decent rains in the past month, Russia has not. The forecast for the former remains beneficial for most of the country except the far east. All but the south of Russia though is forecast to remain hot and dry for the next two weeks. The latter situation certainly merits watching, as the unusual heat and dryness being experienced now is already being compared to the great drought of 2010. That pushed the price of London wheat up by GBP50/tonne during the month of July, and prices added a further GBP50/tonne between then and the end of the year.